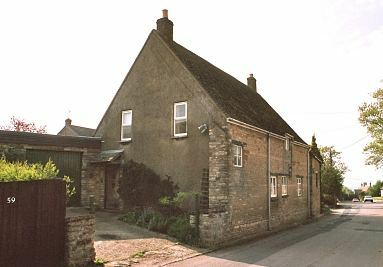 In 1732, the parish of Hallaton purchased a building for use as a workhouse with money bequeathed for the purpose by the Revd. Benjamin Bewicke. The parish subsequently acquired various property including a close called the Workhouse Close, whose rents contributed to the poor rates. A parliamentary report of 1777 recorded a parish workhouse in operation in Uppingham with accommodation for up to 40 inmates and at Halloughton [Hallaton] for 16. 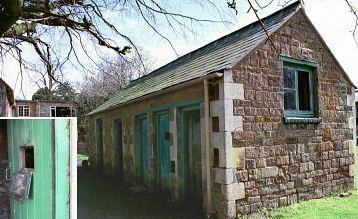 A parish workhouse in Belton is believed to have operated in the nineteenth century in the building (now a garage) next to 5 Main Street. A building on the High Street in Gretton was once used as the parish workhouse. 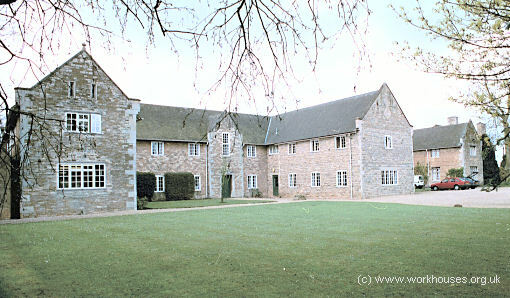 Gretton former parish workhouse, 2004. Medbourne's had a parish workhouse from the late 1700s. It was situated on Main Street where the old smithy now stands. Uppingham Poor Law Union officially came into existence on 23rd April 1836. Its operation was overseen by an elected Board of Guardians, 36 in number, representing its 35 constituent parishes as listed below. County of Rutland: Ayston, Barrowden, Belton, Bisbrooke, Caldecott, Glaston, Liddington, Morcott, North Luffenham, Pilton, Preston, Ridlington, Seaton, South Luffenham, Stoke Dry, Thorpe by Water, Uppingham (2), Wardley, Wing. County of Leicester: Blaston, Bringhurst, Drayton, Easton Magna, Hallaton, Holt, Horninghold, Medbourne, Slawston (until 1895), Stockerston. County of Northampton: Fineshade, Gretton, Harringworth, Laxton, Rockingham, Wakerley. Later Additions: Beaumont Chase (from 1861). The population falling within the Union at the 1831 census had been 11,027 with parishes ranging in size from Holt (population 42) to Uppingham itself (1,754). The average annual poor-rate expenditure for the period 1833-5 had been £8,068 or 14s.8d. per head of the population. Uppingham entrance from the north-east, c.1916. 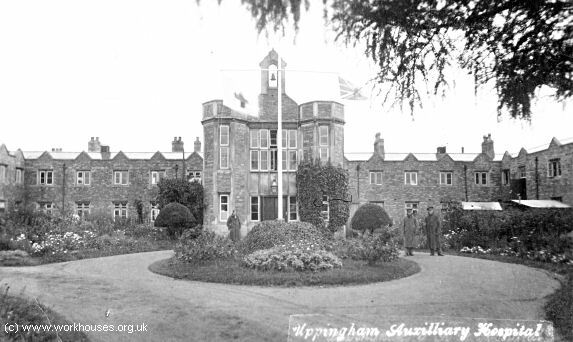 Uppingham main block from the east, 1929. Uppingham from the south-west, 1929. 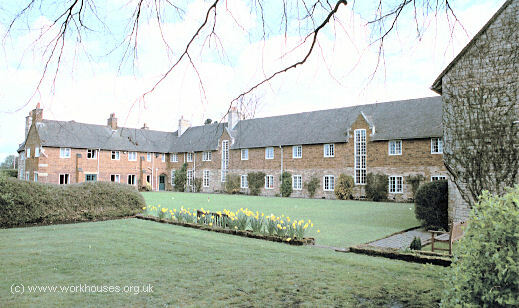 Uppingham main block from the south, 2000. Uppingham casuals' block from the west, 2000. In 1916, the site was taken over by the Red Cross as a military auxiliary hospital and the then inmates were transferred to the workhouses at Oakham and Stamford. The workhouse never re-opened and in 1926 the site was sold for £2,500 to Uppingham School, who remodelled the buildings. The school still occupies the premises. Uppingham main block from the east, 2000. The Record Office for Leicestershire, Leicester and Rutland, Long Street, Wigston Magna, Leicester, LE18 2AH. Relatively few records survive — holdings comprise: Guardians' minutes (1836-1930); Ledgers (1894-1929); Letter books (1913-21); Service registers (1897-1930). Uppingham — A Picture Book of a Unique School by W Metcalfe (Spiegel Press).